As child obesity rates rise in North America, some people are dreaming up really creative ways to get their kids to exercise and stay active. Let’s face it, not everyone their age is into sports and sometimes we don’t have the time or the money to join sports teams or leagues. Some kids don’t like competitive sports for all the right reasons. Soccer Moms know how much time and energy is involved in keeping their kids active, but really, all it takes is a little imagination to find fun activities that will increase heart rates. Hula hooping has a long history and is now making a giant comeback. The hoop first gained international popularity in the late 1950s when a plastic version was successfully marketed by California’s Wham-O toy company, Now ‘hooping’ has found its way into mainstream gyms and studios as a fun and effective form of exercise. Classes can be found all across the US and Canada as more and more people rediscover that this exercise can be entertaining as well. In the summer months you can check out various parks around the city and see the hoop jams that have been organized. Often you will find circus type people, impressing us with their poi skills or do trying to improve their juggling abilities. If you don’t want to join the circus school that’s ok, all you have to do is check out u-tube to learn some new moves. The internet is full of discussion forums, groups and a resource of resources for those interested in trying the join the active hula hooping craze. Don’t worry Dad’s it’s not just for the girls, hula hoops are great for hand eye coordination and there are so many types of tricks to do rather than use the feminine hips moves. 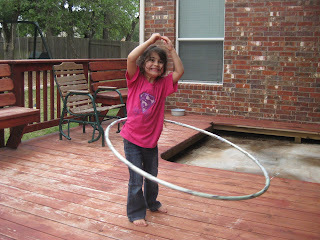 Hula hooping is something you can try with your kids. There are so many benefits for the whole family. It’s true the hula hoop is making a come back, at least in the Toronto area. Hoop Toronto has a lot more classes available across the city. This trendy toy hoop is not only twirled around the waist but also the other limbs or neck in very interesting ways that involve the science of physics. The hoop active play works more than 30 core muscles to sculpt abdominal, builds muscle as well as strengthens them, improves balance, flexibility, and cardiovascular health. Hooping has been known to promote happiness, self-esteem, confidence, and laughter. All the things to consider when searching out fun active exercises for your children or yourself. In addition to the physical and mental healing qualities of hooping, learning a new skill helps keep the mind active, strengthening neurological pathways, thus reducing risk for dementia in your older years. That’s right, don’t forget granny or gramps, get them moving too. Try not to laugh at them too much. It always seems a little difficult at first. The rhythm of hooping has been likened to being rocked as a baby, a form of meditation, and concentration for those with special needs. Although the exact origins of hula hoops are unknown, children and adults around the world have played with hoops, twirling, rolling and throwing them throughout history. Hula hoops for children generally measure approximately 71 centimeters (28 in) in diameter, and those for adults around 1.02 metres (40 in). Traditional materials for hoops include willow, rattan (a flexible and strong vine), grapevines and stiff grasses. Today, they are usually made of plastic tubing and include sparkly decorative tape, and some even fold up like a ninja. The LED hula hoops have lights to give those dark evenings twirls of beautiful flashes of colour. The fitness movement began through gymnastics programs apparently Marclaren in England recognized the importance of regular progressive exercise and the need for fitness and training programs for youth to help alleviate worry and stress. In 1176 – 1860, European Gymnasts brought fitness to the U.S. Franklin and Jefferson recommended regular exercise to maintain health, however the education system did not include physical exercise until the mid 19th century when industry and mechanical technologies replaced heavy labor jobs. 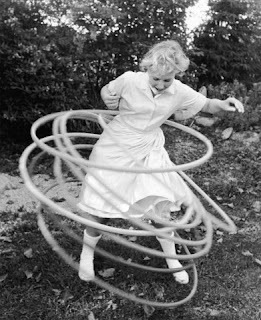 And nowadays adult hoops for beginners are larger, heavier, and much easier to use than the small plastic hoops from the 50s. With one hand on each side, hold the hoop horizontally so that it touches the small of your back. Wind up by holding the hoop and turning your body in one direction to give the hoop an energetic spin around your waist in the opposite direction (most people prefer spinning the hoop in one direction over another). Push your belly/hip forward pushing firmly each time the hoop crosses your stomach, shifting your weight back and forth, forward and back. Keep both feet on the ground as you push your belly/hip forward with each revolution of the hoop, slightly bending and straightening the forward leg, shifting your weight, rocking front to back on each push of your hips. The push of your hip back is as important as the forward push. Stand inside the hoop and place your feet hip distance apart and bend your knees a little. With one hand on each side, hold the hoop horizontally so it firmly touches the small of your back. Wind up and turn your body in one direction and give the hoop an energetic spin around your waist in the opposite direction. Move your hips side to side, pushing the hoop as it passes over each hip. Remember to keep your hands and elbows above the hoop. Avoid moving your hips in a circular motion. This will slow down the hoop. As in all exercise, it is best to exercise both directions to equally balance and tone your muscles as you hoop. Bend your knees to get beneath the hoop while pushing your hips really fast to coax the hoop back up to your waist. Turn your body in the direction of the flow of the hoop while pushing hips really fast. To level the flow of the hoop, correct your posture by standing up straight. If that does not work, adjust the position of your feet. If one foot is in the front, switch the back foot to the front. There are many ways to learn to hoop: take classes, watch online tutorials, read books about hooping, attend hoop gatherings, jams etc. There are so many reasons to have a favourite hoop available for play. There are so many physical, social and emotional benefits of the various types of hula hooping. Try an internet search and see how easy you can begin. Simply make the hula hoops at home with tubing from your local hardware store and decorate them with your children. Involve them in the fun easy creation and decoration process and come up with different sizes and patterns to explore with. Who knows, this may make an excellent science project in the future.